Description: Thallus a blackish-brown to burnt ochre, extensive, orbicular crust, often centrally peeling from the substrate. Thallus with a distinct margin. Thallus formed of erect filaments curving up froma prostrate system. Filaments fused, not easily separable under pressure, usually more than 10 cells long each cell with a single discoid chloroplast. Hairs present. Club-shaped multicellular (6-12 cells) paraphyses present. Unilocualr sporangia terminal in sori; plurilocular sporangia multiseriate, terminal in sori. 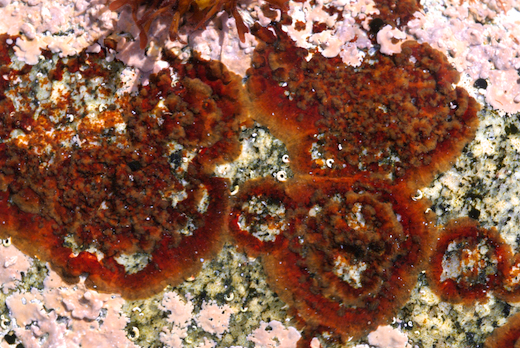 Habitat: upper to lower intertidal in pools on rock. Site © M.D. Guiry 2000 - 2019. Important copyright notice: all text, design and photographs on this site are copyrighted by M.D. Guiry unless otherwise stated and all rights are strictly reserved. Click here for copyright information and contact. Website design: 249 Design Studio. Site maintained by M.D. Guiry (michael.guiry@nuigalway.ie). There have been 8736821 page loads since 1 January 2014 on 25 April 2019.